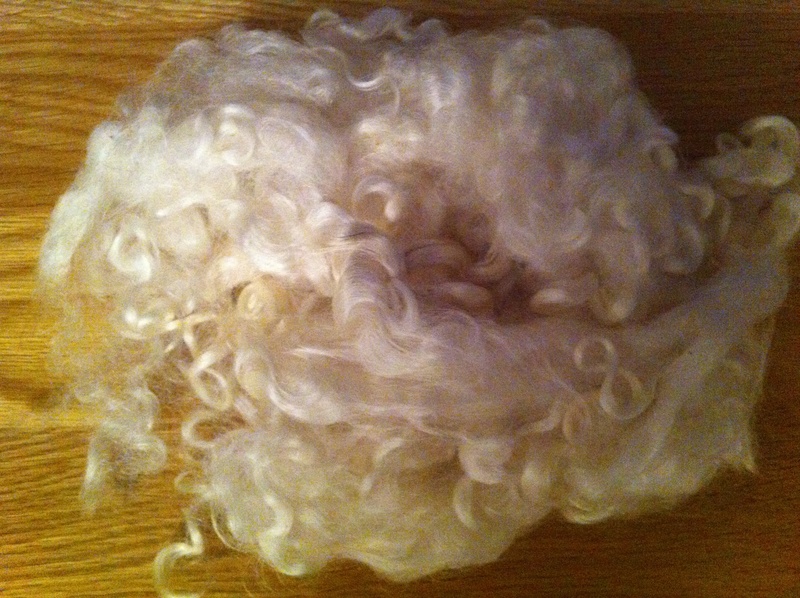 I decided that I wanted Twyla’s hair to be curly, so purchased some white Wemsleydale fleece from EBay which was supplied in a bundle and the curls had to be carefully separated. As her skin is a blue/ purple colour, I thought white would look quite striking. I’m thinking of an Ice Queen type style for her new image. 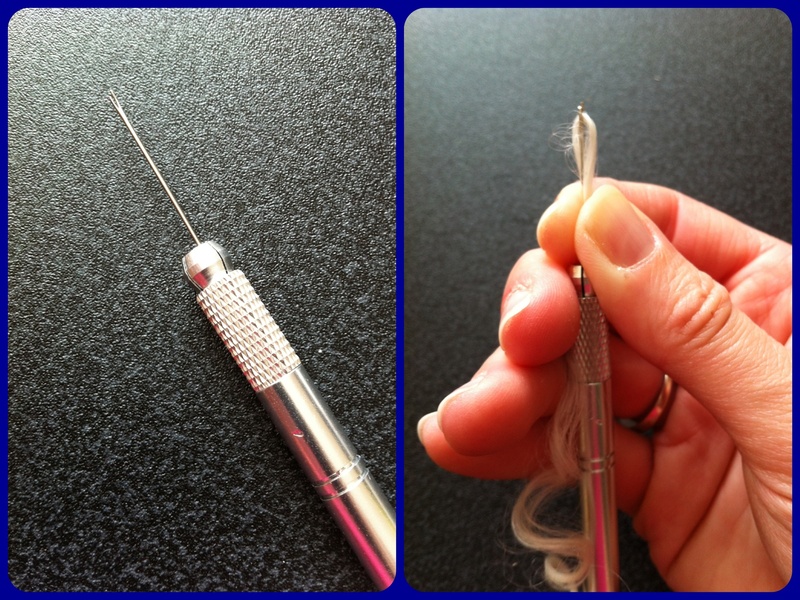 I made my own re-rooting tool using a sewing needle with the top of the eye cut off (one side needs to be longer than the other), which I clamped into a tool that I have for hair extensions. If you have a craft cutter, this would also be suitable to clamp the needle into the cross section. 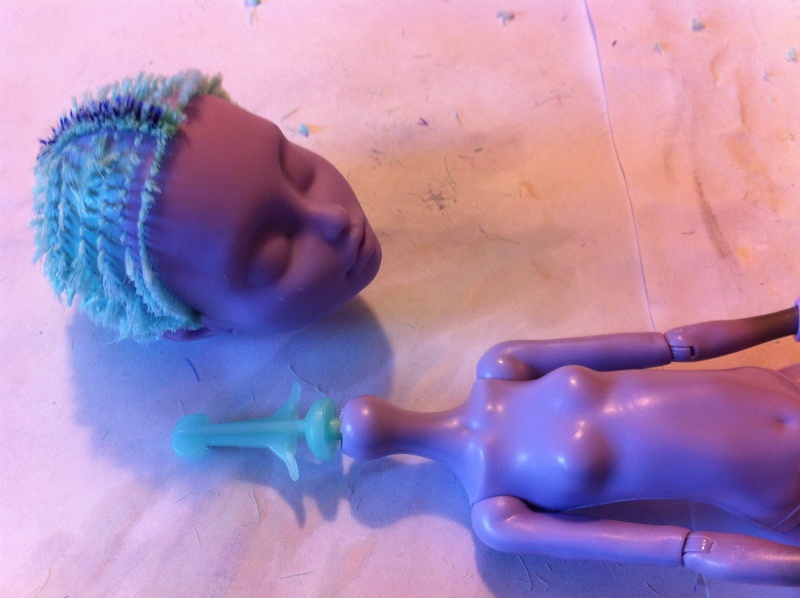 The hair for re-rooting is then pushed into the fork of the needle which needs to be pulled taught and then pushed through the plug holes on the dolls head. Please check out YouTube for some really good videos about different rooting methods. I had previously painted her scalp white, but she has so much hair, this probably wasn’t necessary. I worked my way along the bottom of her head inserting the new hair and trimming away the excess inside. As it won’t be possible to brush her hair, I will place some flexible glue inside the head which will hopefully be enough to hold it in place. 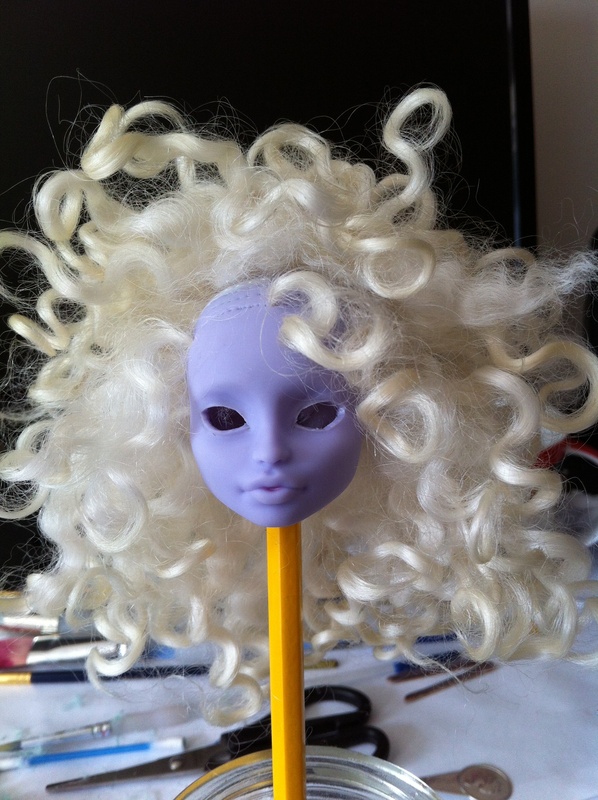 I worked most of the holes inserting new plugs of crazy white curls, but I’ve left some at the front unplugged for the moment, because I need space to insert her eyes and lashes. I’m loving her big bouffant hair! What do you think so far? All I can say is poor Twyla! 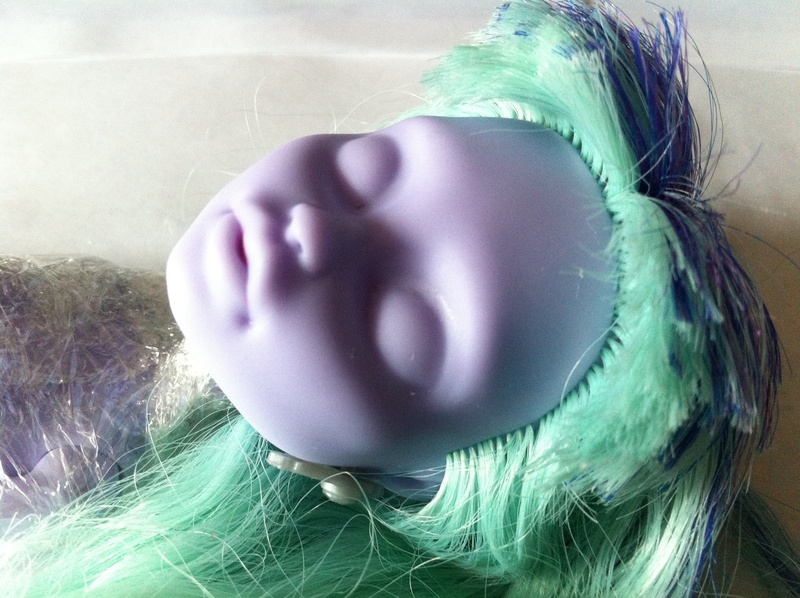 On Saturday, I took a deep nervous breath and said goodbye to my Monster High doll as she previously looked. I was very apprehensive about doing this, in case I completely ruin her, but there’s no going back now. The first job was to wrap the dolls body in cling film and remove her face. I used nail polish remover (acetone) with cotton buds and cotton wool balls. The dolls body was protected with Cling Film because apparently the body starts to break down in contact with Acetone. 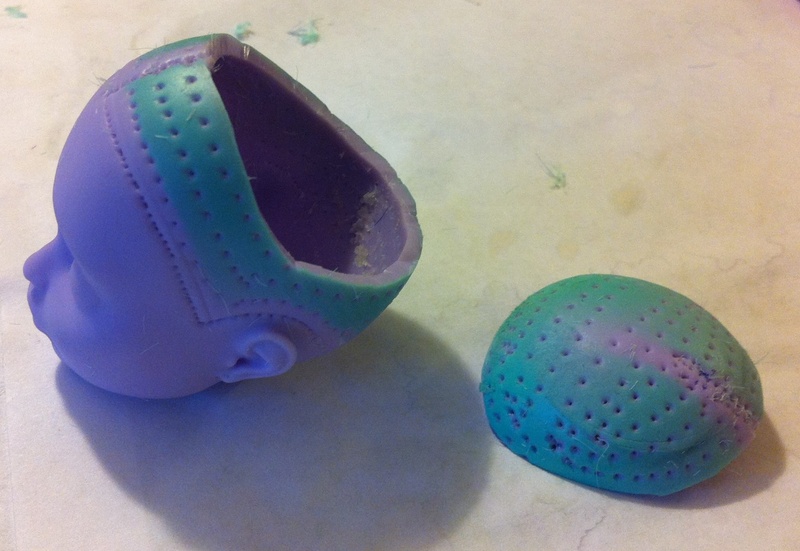 On the face the paint kind of smears as you swab it, but this isn’t a problem as you just remove it with more acetone. After all the paint was removed I washed her face with soap and water. 1. Blowing a hot Hair dryer around her neck area. 2. unking her head in boiling hot water (kids please ensure you are supervised by an adult). I chose the hair dryer option. It took three or four blasts of hot hair and the head removed in stages. You need to be careful when doing this, as there is a plastic piece in the neck which could break if you pull it too hard and without enough heat to soften the vinyl. The next stage is the worst bit! The dolls hair was held in place with glue, which I started off trying to remove by sticking tweezers in through the tiny neck hole. I didn’t have much luck with this method, so then put the hair dryer on her head to soften the glue. Once softened I managed to pull out large lumps of glue, but it was a slow process which didn’t result in vast quantities of hair coming out. By this point my fingers were getting sore, so I dunked the head in boiling water which resulted in further lumps coming out, but there was still lots of hair attached. As I am planning on putting in new glass eyes, I decided to cut the top of the scalp off so that I could remove the rest of the hair and get to the eye sockets. 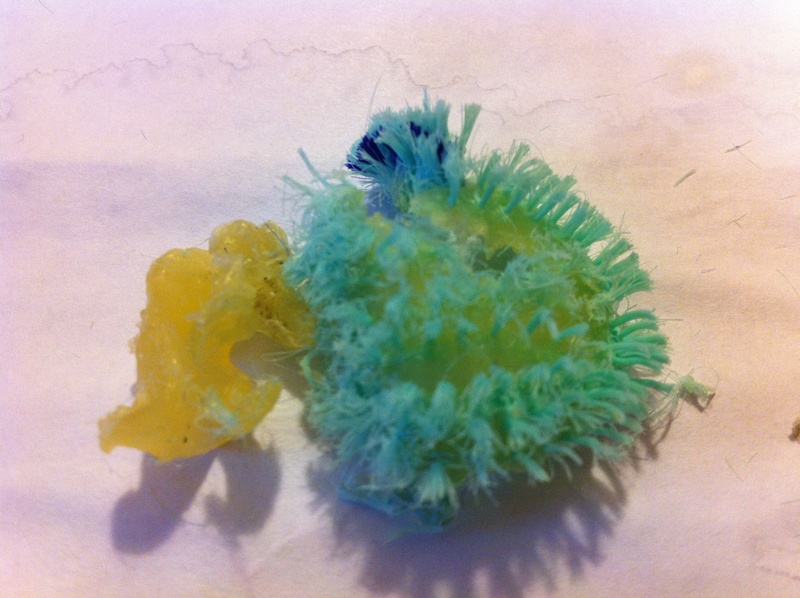 I was shocked how much glue was left inside the head! I did this by simply drawing a pencil line around where I was going to cut. I tried to draw the line in between the plug holes so that I could preserve as many plugs as possible. Then using a craft knife, cut around the line. 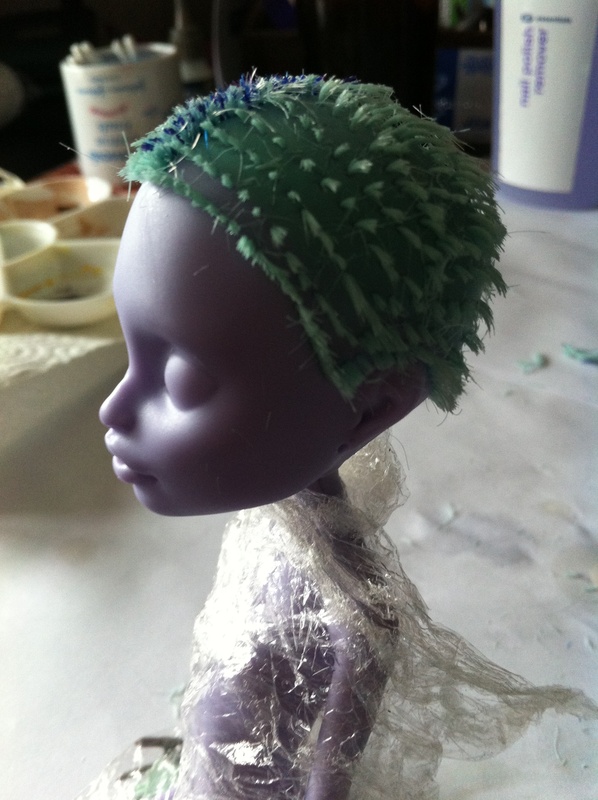 I used more acetone to remove the factory green paint on her head. Now this was scary! I drew around the part that I wanted to cut away with a pencil and then cut out each eye with the craft knife. I cut really slowly to avoid slipping and cutting into her face. I didn’t manage to cut both eyes totally symmetrical but I am happy with the end result. I will post again soon with the next steps! 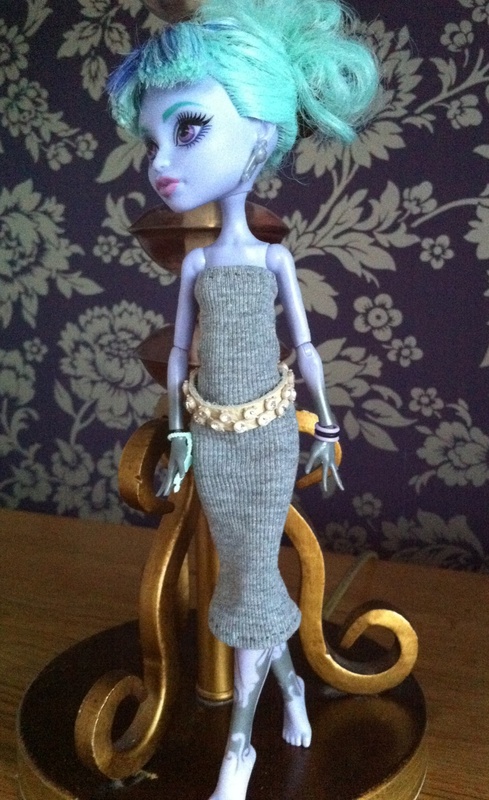 Monster High dress and accessories…..
I’m still on a Monster High at the moment! This week I have stitched Twyla a slinky little grey tube dress and I’ve made her a cream leather jewelled belt and matching leather clutch bag. She’s nearly ready for a night on the town. All she needs are some shoes, jewellery and perhaps a jacket! I have had a fascination with fashion dolls for a while now and have been debating buying a Blythe or Pullip doll. Anyone that is interested in them will know that they are expensive, so I started hunting around for a cheaper doll that I could customise, without having to worry about money wasted if it got wrecked during its makeover! I considered a Tangkou doll which have the same cute appeal as Pullips but for a fraction of the price. But when Internet searching, I discovered that people are customising Monster High dolls. 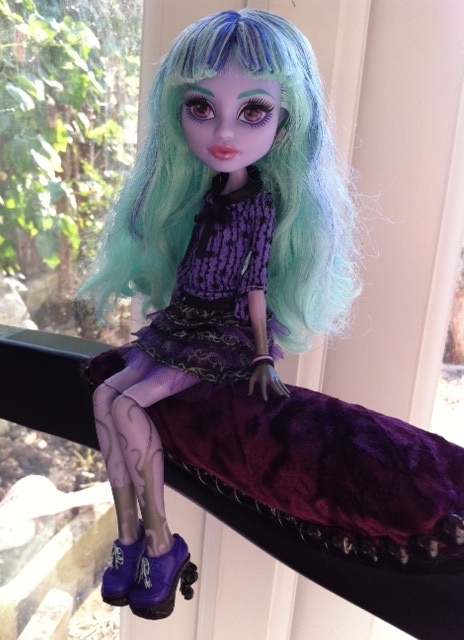 So, here is the lovely Twyla Thirteen Wishes doll that I bought….. I think she is gorgeous, but she is going to have a little makeover! 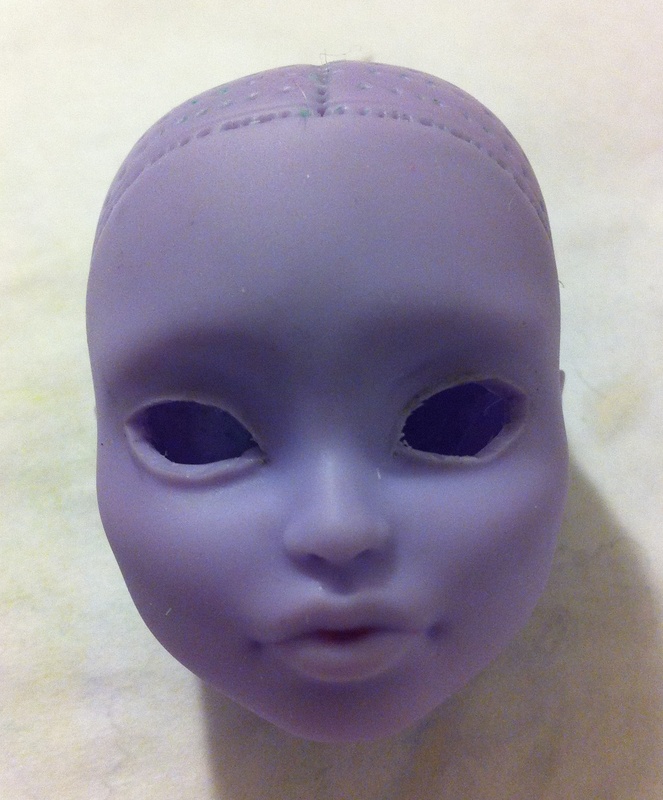 Her face will be removed, she will be given new glass eyes, new face and a new hair style. Of course, her new look wouldn’t be complete without some new clothes too! My fiancé thinks that I am having a midlife crisis. Perhaps he is right?! ?